Hong Kong Island was ceded permanently to Britain by the 1842 Treaty of Nanking. Kowloon, at the tip of the peninsular opposite the island, was ceded permanently by the 1860 Convention of Peking. The New Territories were leased for 99-years in 1898. It became plain during the 1970s that the People’s Republic of China would not agree to any extension of the lease after its expiry in 1997. Since the Crown Colony was unviable without the New Territories, talks between China and Britain began in 1982 over the future of Hong Kong. They culminated in a Joint Declaration that entered into force in 1985 under which Hong Kong would become, on 1 July 1997, a Special Administrative Region (SAR) of the People’s Republic with a high degree of autonomy for 50 years. This ‘one country, two systems’ principle was embodied in the Basic Law of 1990 and became the constitution of the SAR. Section XI of Annex I of the Declaration provided that ‘The United Kingdom may establish a Consulate-General in the Hong Kong Special Administrative Region’. The negotiators of the subsequent Defence Lands Agreement on the transfer of Ministry of Defence sites to China did not take that opportunity, as history might have suggested, to earmark a site for the future British consulate-general. The FCO’s Hong Kong and Overseas Estate Departments therefore began to address the choice of a site in 1986. The consulate-general would embrace the activities of four British bodies: the long-established British Trade Commission, the Joint Liaison Group (which was negotiating the details of transfer and would be phased out in due course), the passport/immigration functions then being carried out by the Immigration Department of the Hong Kong Government, and the British Council. There was a strong case for a single building to house all of these activities to help boost confidence in Britain’s future role in Hong Kong. The governor, Sir David Wilson, thought the building should have ‘dignity without prominence’: the Prime Minister, Margaret Thatcher, wanted Britain to have a ‘prestigious building’. There was no doubt that the consulate-general should be in, or close to, the Central district of Hong Kong. There were several accommodation options for the FCO: to lease the requisite space in an existing or forthcoming building, to buy a suitable building, to find a development partner who would fund a new building in return for future rent, and to acquire a site and build on it with Voted funds. An early preference, more wishful thinking than realistic even though long favoured by the House of Commons’ Foreign Affairs Committee, was to acquire the Prince of Wales Building in HMS Tamar. The two principal British commercial land developers in Hong Kong, Swire and Hong Kong Land, were both keen to attract the consulate-general to one of their own present or projected buildings and lobbied extensively to this end. All of the commercial options, however, proved impossibly more expensive than the development of a site that either belonged to the Hong Kong Government or was part of the Ministry of Defence estate that was reverting to China. The acquiescence of the Chinese government, however, would be necessary in either of these instances. Francis Maude, the FCO minister of state, pushed the governor hard for a Hong Kong government site and the choice narrowed to two: Beconsfield House in Central, and Colvin House, formerly the NAAFI site within the old Victoria Barracks which lay just to the east of Central towards Wanchai. Colvin House gradually won the argument because it was more easily accessible, especially for the large number of students who would be attending the British Council’s English language teaching operation. It was just up the hill from Pacific Place, then under development by Swire, which was likely to become the hinge of urban development between Central and Wanchai, and close to the new Law Courts building. There were two nice incidental touches as well: the new civic gardens through the old Victoria Barracks afforded a pleasant walk into Central, and the consulate-general would stand at the corner of Supreme Court Road with Justice Drive. The Hong Kong government transferred the site cost-free to the British government by a Private Treaty Grant in April 1993, and specified a maximum 19,000 square metres of total gross floor area. The FCO selected Swire Property Projects Ltd as project managers, not least because of the symbiosis between Swire’s Pacific Place developments and the consulate-general. 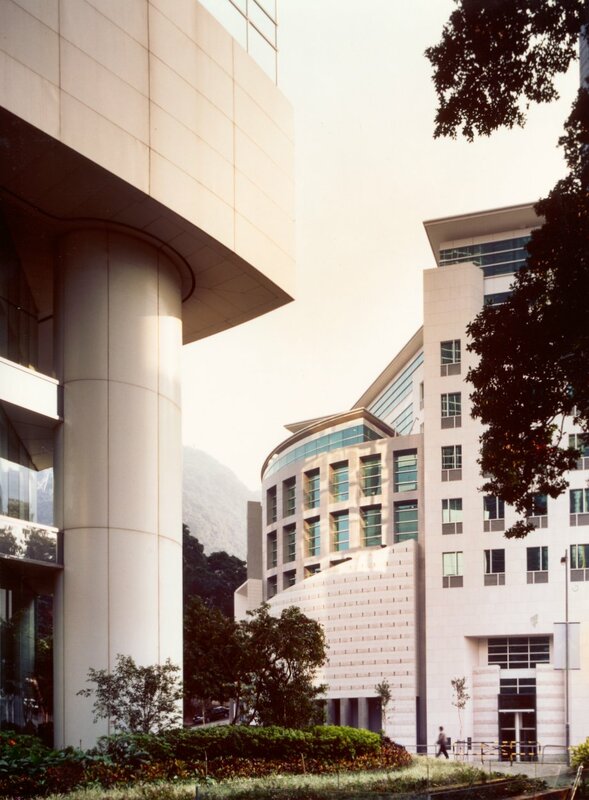 In 1992, a limited architectural design competition for the consulate-general building was held between six firms with experience of building in Hong Kong (Terry Farrell and Company, Leigh and Orange/John R Harris Partnership, Llewellyn-Davies Weeks HK, Palmer and Turner, Property Services Agency, and RMJM HK).The required accommodation amounted to about 12,000 square metres, of which about 20 per cent was for consular, passport and immigration functions, 25 per cent for other consulate-general offices, 42 per cent for the British Council (including about thirty classrooms), and 13 per cent for staff accommodation (nine flats for UK staff). The main difficulty in formulating the brief was deciding how much space should be provided for the Passport Section, given that there was expected to be a huge initial uptake and then a quieter period until renewals became necessary. Assessment of the competition entries was unusually straightforward. Most of them offered variations of Hong Kong’s normal manner of arranging a slab block on a site. 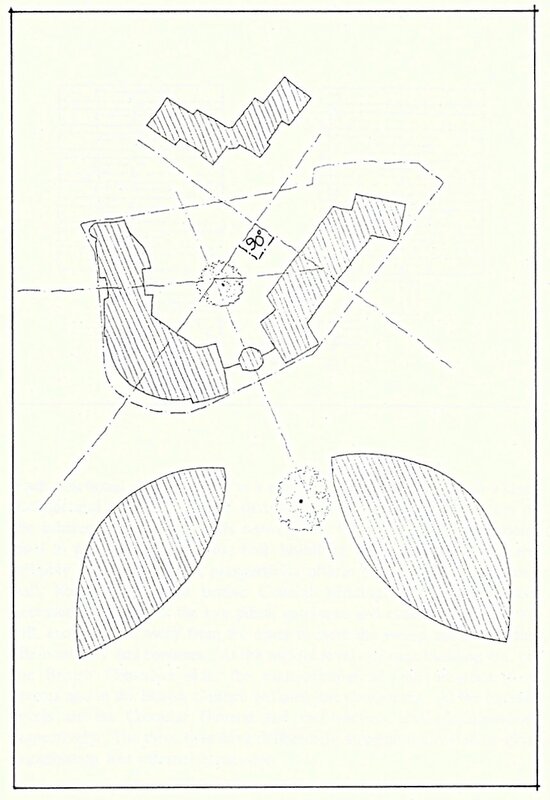 Only Terry Farrell proposed a radically different approach: his concept of building around the curved lower perimeter of the site, thereby finding an urban as well as an architectural solution, brought numerous other advantages of identity, access, economy, landscape, privacy and environment. The Farrell design was selected, and Ove Arup appointed as structural and services engineers, and Widnell as quantity surveyors. FCO’s project manager, Stephen Whittle, and the British Council’s architectural adviser, Malcolm Reading, worked well with the Swire and Farrell teams through all of the subsequent design development and construction stages. The tender for the site formation contract was won by Gammon and for the main contract by John Laing International in conjunction with Hip Hing Construction. The Foreign Secretary, Malcolm Rifkind, performed the topping-out ceremony in January 1996, and the building was formally opened by HRH The Princess Royal on 30 January 1997, five months before Hong Kong’s reversion to Chinese sovereignty. A facilities management contract was in place with Colliers Jardine by the time the consulate-general took up occupation. The building’s outturn cost was about £30 million. The British government’s post-World War II representation in the crown colony of Hong Kong was a Trade Commission. Its offices were on the 7th floor of Shell House at 24/28 Queen’s Road Central in the 1970s and then on the 9th floor of Bank of America Tower (formerly Gammon House) at 12 Harcourt Road until the reversion of sovereignty. The senior trade commissioners had their residence at 2 Kellett View on Mount Kellett Road before moving in 1989 into the second penthouse on the 36th floor of The Albany. Layout diagram from Farrell’s competition submission, 1992. 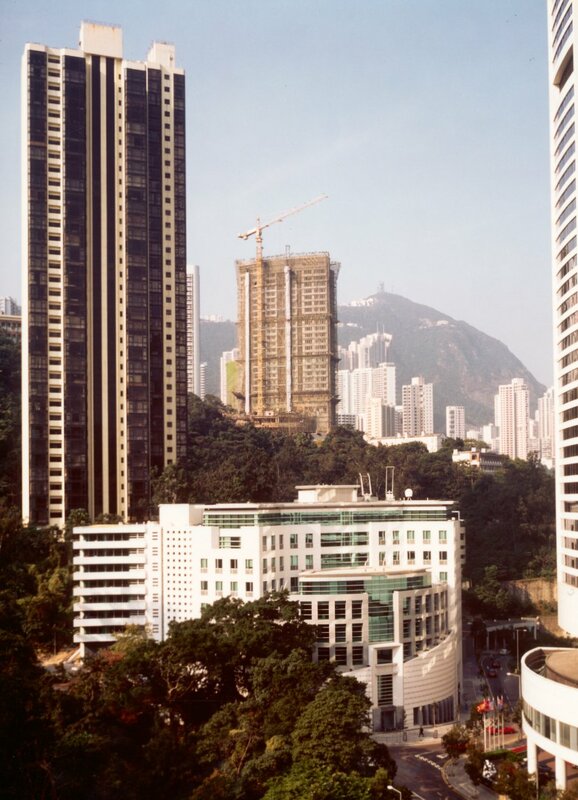 The consulate-general block (left) and the British Council building (right) are at right-angles to each other, and the opening between them faces the gap between the two hotel towers. 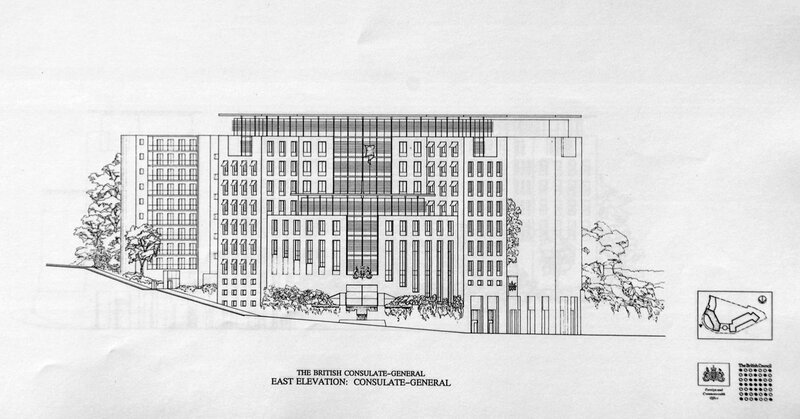 Competition drawing of east elevation. Section through entrance pavilion and private garden area. 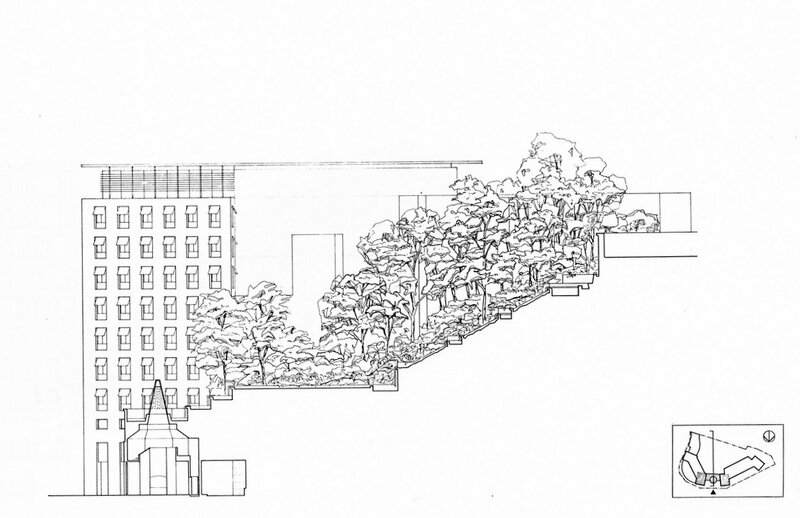 Drawing of ‘unwrapped’ public elevations. View from the north-west, with British Council entrance straight ahead, and hotel at left, 1997. 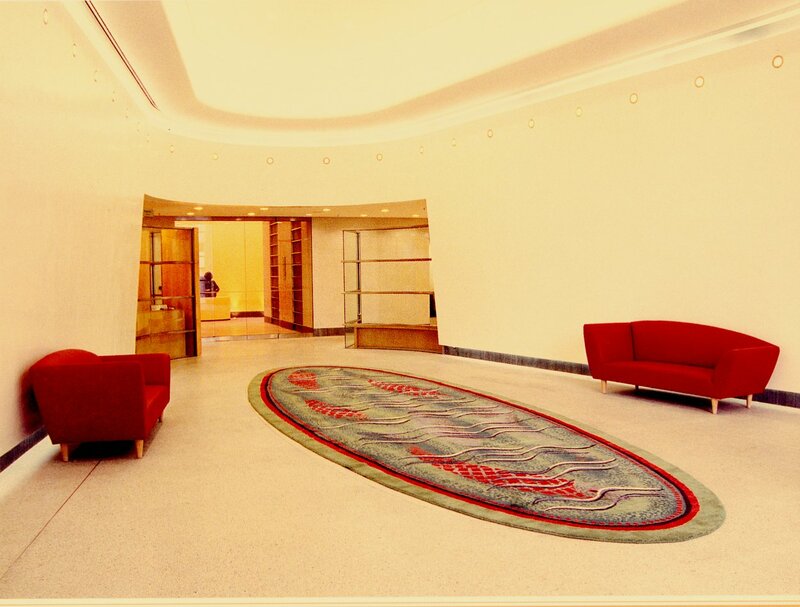 Carp Pond carpet, designed by Cressida Bell, and woven in Nepal, 1997. 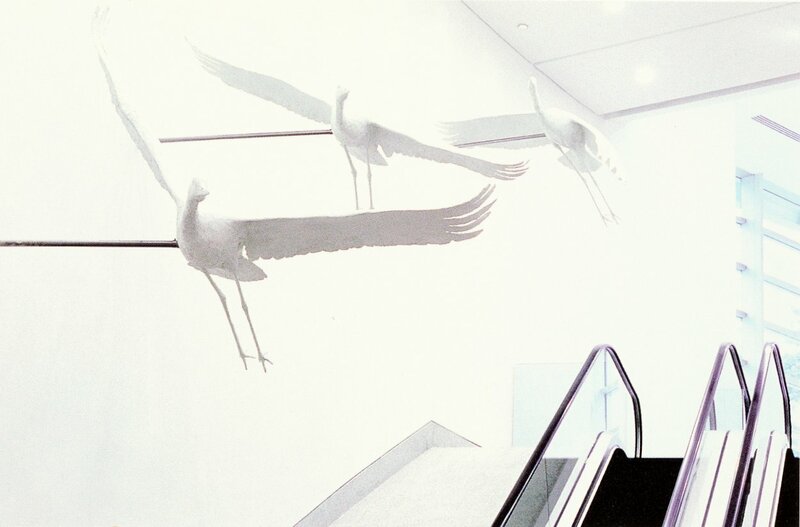 Three Cranes, by sculptor David Annand, flying above the main escalator, 1997.